Not just limiting itself to providing additional parking, this unique three-car garage apartment plan avails itself of a variety of other uses adding extra value to your already existing home. With two bedrooms, a living room, kitchen, and a dining room located above the garage, the possibilities of how to utilize this space are quite extensive. Serving as a guesthouse, it allows visiting friends and family not only their own privacy, but also gives you, as host, the chance to relax without feeling like you’re running a bed and breakfast. A more permanent occupant may appreciate the living quarters as they may be utilized as residence for a nanny or other home-based employee. If the kids have their nanny years behind them, this garage apartment plan works wonderfully as a home for returning college students or even the post college student who is still hanging around. Beyond serving living needs, the finished living space could function as the setting for a home-based office by providing a meeting area for clients in a rustic, welcoming, and professional setting. For those with storage needs, there is plenty of room for parking and storage in the three-car garage. 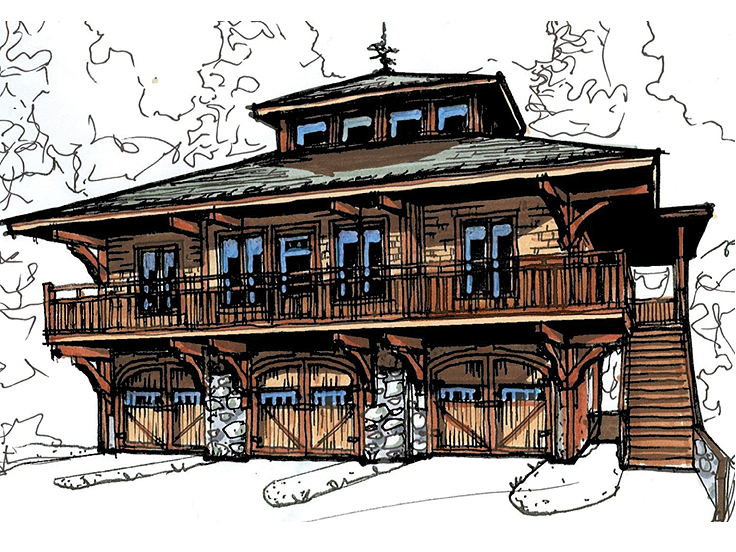 To view even more garage plans with living quarters like this one, please browse our collection of garage apartment plans. Hello and thank you for your time today. How many square feet is this Rustic 3 car garage? Upper living area and parking garage area? Are the plans available with an entirely open second floor? What height is the second floor ceiling? Hello could I get additional Information on the rustic design garage with living quarters above pls. Thank you for your interest in design 039G-0001. You can find all of the details about this plan at the link below. Or you can visit http://www.thegarageplanshop.com and enter plan # 039G-0001 to view details about this plan.